A call to Adam Essex at Princess Brokerage International confirms that the sale of the 29m motor yacht Rosso has now been completed in an in-house deal. 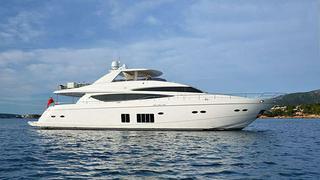 This Princess 95 was built for an experienced owner by Princess Yachts in 2011 to a very high standard. She features powerful twin MTU 2,433hp engines, zero-speed stabilisers, a hydraulic swim platform and accommodates eight guests and five crew.